Unhealthy Obsession with Cars: $100,000 Cadillac? $100,000 Cadillac? I bet you never thought you'd see the day. However, it's not the planned ultra-luxury sedan that Bob Lutz wants so badly...in this case it is the V-series version of the XLR roadster. It's MSRP is $100,000 including destination (I'd certainly hope!). 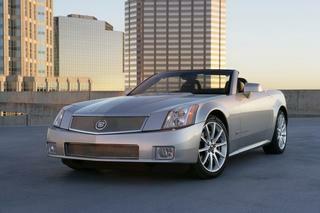 The XLR is the retractable hard-top convertible, based on the same chassis as the C6 Corvette. In it's normal trim, it is powered by a 4.6l Northstar V-8 pushing 320hp through a rear-mounted 6-speed automatic. The XLR-V uses a supercharged 4.4l version of the Northstar that puts out 443hp. Also featured on the XLR-V is an upgraded interior with Zingana wood trim.